This years World Series winner is [insert winner here]. Oh whoops. A little glance behind the curtain for you folks. You see, sometimes we have to write our articles in advance. Sometimes, we start working on them before we totally know what’s going to happen. Sometimes, that’s really difficult. This year World Series was an exception. Through six games this years Fall Classic was truly that: a classic. The San Francisco Giants and Kansas City Royals played each other to a draw in one of the most entertaining, suspenseful and divisive series in recent memory. More than that, it’s been one of the most surprising Series I can remember, on a number of levels. Not since the 1991 World Series, when the last-to-first Twins met the last-to-first Braves, has an unlikelier set of opponents managed to sneak all the way to the end. I mean, who in the blue hell saw this thing coming? 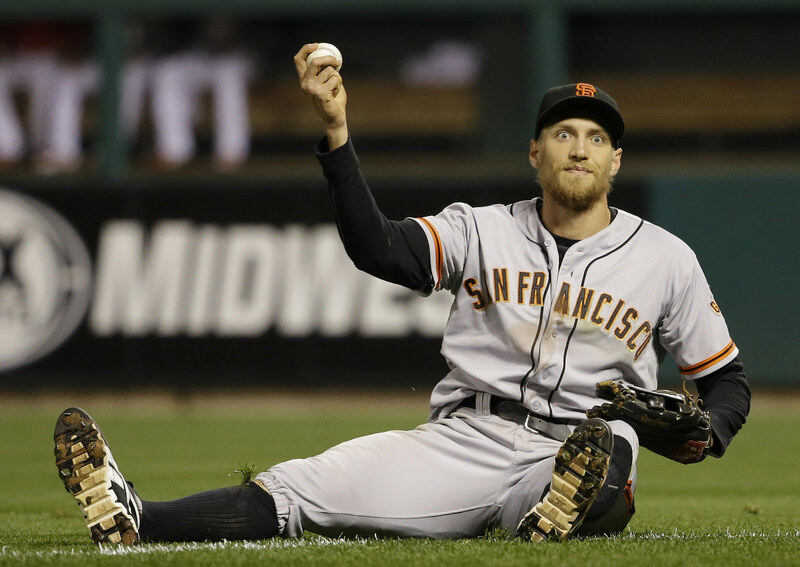 Hunter Pence was as surprised as you were. San Francisco hung around the playoff picture all season and with titles in 2010 and 2012, you can’t exactly call them an underdog in the true sense of the word. In fact, with a San Fran win this year people are rightly or wrongly going to start throwing around the big D word – dynasty. Still, their run this year was improbable. This team, talent-wise, was clearly a step below the past championship teams. I heard an excellent point made on the radio this morning by a beat writer. Gun to your head, what would you say San Francisco is good at? Their best hitters, Hunter Pence aside, struggled through terrible seasons, Pablo Sandoval especially. Their starting pitching goes exactly one pitcher deep, in terms of consistency (more on this later). And Sergio Romo, their lights out closer from the past few seasons, spent the year imploding. The rest of the bullpen and their fielding is league average. Does that sound like a team playing for a World Series title tonight? I mean, what are these guys trying to pull here?! The craziest part might be that of the two teams in the series, the Giants are actually the team that was more likely to make it. The Kansas City Royals are undoubtedly being cheered on by most any baseball enthusiast that doesn’t count themselves as a fan of the Giants. A team that hadn’t appeared in the playoffs since 1985 took advantage of baseball’s new two Wild Card format. They sat in or close to the second Wild Card spot for most of the season, when they weren’t leapfrogging back and forth with the Detroit Tigers for the lead in the American League Central. They actually wound up overtaking Oakland and technically winning the ‘first’ Wild Card, meaning the one game Wild Card playoff would be played on their home turf. Beginning with that Wild Card game, the Kansas City Royals reeled off a streak so unlikely that I can’t remember ever seeing its like in all the baseball I’ve watched or read about in my life. An underachieving team full of talented but flawed ‘prospects’, a team with a disparaged manager and a line-up with holes everywhere, started to play like the 1927 Yankees. They put up eight straight wins, knocking out the heavily favoured Oakland, Los Angeles and Baltimore in the process. Hosmer. Moustakas. Gordon. All names that have made Royals fans feel a litany of emotions over the past few years. Hope and excitement at first, followed by anxiety and most often recently, frustration (or possibly rage). But during these playoffs, that frustration melted away. Everything clicked at the same time. The team started to hit. 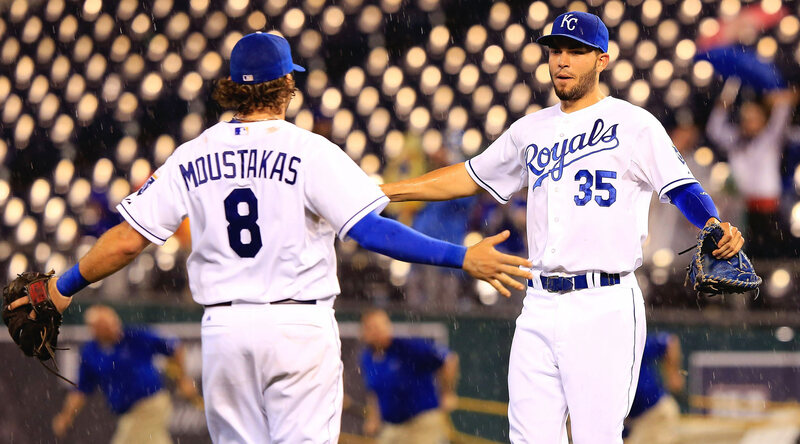 Couple that with an otherworldly bullpen and blinding team speed and these Royals became a juggernaut. The Kansas City Royals were fired up. It’s funny. Despite the Series being so exciting, only one of the first six games has been close: Game 3. Every other game has had at least a 5-run differential, not exactly what you’d expect in a major sports final. That said, Game 7’s match-up between Tim Hudson and Jeremy Guthrie is a re-match of that closely contested Game 3. Last time it was the Series first game in San Fran. Tonight it’s in Kansas City. It’s all circular man! Regardless of who wins, the biggest takeaway from this Series, for me, will be the ascendance of Madison Bumgarner to upper tier status. While he’s been San Francisco’s ace for a couple seasons, he rarely got mentioned among the Kershaw-Hernandez-Scherzer-Verlander-Price-Lester-Darvish super elite class. Those days are over. Bumgarner is a unique case. A big, dominant lefty, he seems like he’s been in the league awhile. He’s on the verge of winning his third World Series title! And yet, his age? Just 25 years old. He debuted at age 20 for the Giants in 2009 and made the club for good halfway through that 2010 World Series year. He went on to become the youngest player to pitch and win a World Series game, throwing eight shutout innings in Game 4 against Texas. Sound familiar? 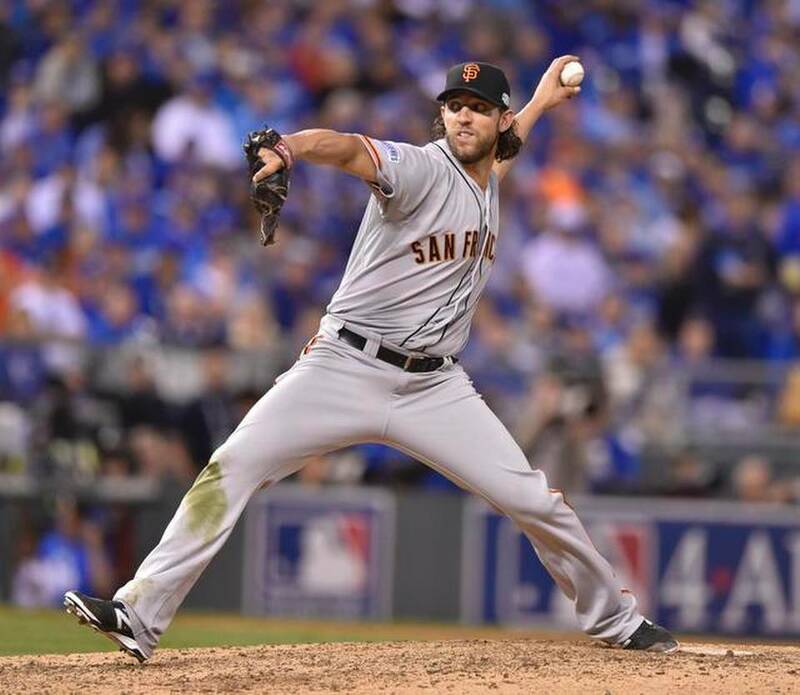 After struggling en route, Bumgarner threw seven scoreless in Game 2 of the 2012 World Series, still just 22 years old. And this post-season? Well, he’s been next level. He threw a complete game shutout against Pittsburgh in the Wild Card play-in game. He pitched 15.2 innings in the series against St Louis, posting a 1.72 ERA and 0.76 WHIP, before being named NLCS MVP. He’s allowed only six total earned runs in six starts throughout the playoffs. And true to form, he made two starts in this World Series, Game 1 and Game 5. He threw a combined 16 innings, giving up just seven hits and one earned run, winning both. As I type this, he’s completed 4 innings of scoreless relief in Game 7 of the most exciting World Series in recent memory. We all know who’s coming back out to pitch the bottom of the 9th. Hosmer-Butler-Gordon are due up for KC, the big boppers. It’s power against power. Let’s see what happens. I am literally live typing this. Eric Hosmer – gets up 2-0 and then strikes out. Bumgarner is nasty. Billy Butler – fouls out to first base. We’re on the cusp. Alex Gordon – Holy crap! Gordon singles to centre, Gregor Blanco screws up and Gordon winds up on third base! Salvador Perez – Battles hard. But fouls out to third base. Big Madison Bumgarner of the San Francisco Giants. Five scoreless innings of relief for Bumgarner. That makes 21 innings pitched in the Series with only eight hits and one run allowed. That’s unmatched. That’s the best World Series pitching performance of all time. It hasn’t happened yet but I’m sure he’ll be named World Series MVP any moment now, making him the 7th player (all from the NL, weirdly) to win the NLCS and World Series MVP in the same season. Bumgarner threw 52.2 innings this playoffs. That’s a quarter season for most pitchers! We just saw something truly special. In the past few years, many have complained that the Series has gotten stale, that the playoffs were too much of a crap-shoot, or went on too long, or nobody cared unless the Red Sox/Yankees were playing. Maybe that was true. But the playoffs we just went through were the best I can ever remember. The Cinderella Royals streaked as far as they could possibly go before turning back into a pumpkin. The Giants put themselves in the dynasty conversation. And most importantly, we all got to witness the coronation of best post-season pitcher this side of Andy Pettitte. You want a classic Series? Mix a couple underdogs with some history. And don’t forget to add a pinch of Bumgarner. Great article! On your last points, I find I care less watching the Red Sox in the post season. I watched so much more of this years’ playoffs and really enjoyed it. Tell Daniel Reynolds he’s slipping in editing! Hey Emily! Thanks for the feedback. Just like you, I’m happier to watch teams that are not the Yanks/Sox in the playoffs, but the TV ratings don’t add up unfortunately, which makes zero sense to me, other than the fact that there are roughly eighteen million people in the New York area that don’t care? But you’d think some of them would watch, so who knows. As for Bumgarner’s age, he turned 25 on August 1st, so you’re totally right. I was just going off baseball reference, which has this year listed as his ‘age 24’ season. Good catch!